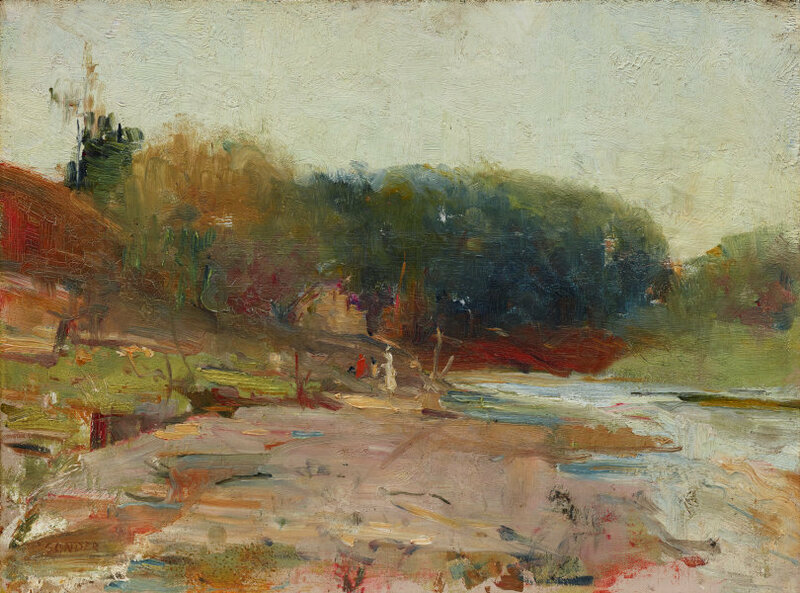 'On the River Yarra, near Heidelberg, Victoria' is a superb plein-air sketch made at the heart of the Heidelberg movement, just below Eaglemont where Conder was camped with his friends Roberts and Streeton during the golden summer of 1889-90. He painted it at the request of Walter Withers, who was for a period working with the group, and probably exhibited it at his studio in Melbourne shortly before his departure in April 1890 to Europe, from which he never returned. Twenty years later Withers sold it through his dealer to the governor of Victoria, writing a letter describing the circumstances of the painting, including how Streeton was at that time working on 'Still glides the stream and shall forever glide', later bought by the Art Gallery of New South Wales. Its fresh, rapid execution (which even contains evidence of the artist's fingerprints, displaying haste to record the effect of the motif as quickly as possible) is a supreme example of the philosophy of plein-airism of the period, and the Corot-esque notion that submission by the artist to the monumental moments of nature had its most ideal expression through the oil sketch. But the appeal of this work, above all perhaps, is that it is a painter's painting; a gift from one artist to another who recognised his language more intimately than the average eye. In this sense it has an alliance with Streeton's 'The road to Templestowe' 1889, which was purchased by Roberts, and Conder's 'Feeding the chickens' 1888, which Conder gave to Streeton. Both these paintings were eventually presented to the Art Gallery of South Australia. They are exactly the same size as 'On the River Yarra, near Heidelberg, Victoria', and this trio of works thus might well be regarded, to borrow from Serusier, 'talismans' of the collegiate spirit of Australian impressionism. Signed l.l. corner, brown oil "C CONDER". Not dated.